I have a confession to make. If it weren't for my Autumn Olive Jam Recipe, I would have lots fewer readers. It seems that all over the country people are wondering what they can do with the fruit of these invasives. 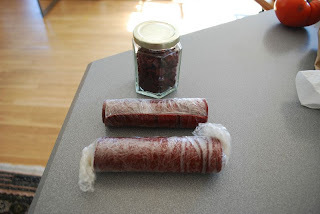 I still have jars of jam from last year, so this year I thought I would make fruit leather. All summer I had been meaning to buy a dehydrator, and here I am a the end of the season without one, so this recipe will be for the oven dried variety of fruit leather. 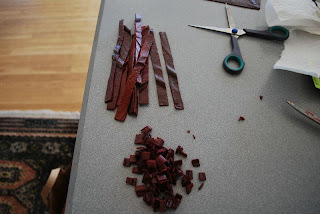 My objective in making the fruit leather was to use it cut up in small chunks the size of dried cranberries to use in salads. I didn't want too sweet a flavor. Why eat Autumn Olive berries? I like the berries because they have that cranberry flavor that we associate with eating game in the fall months. 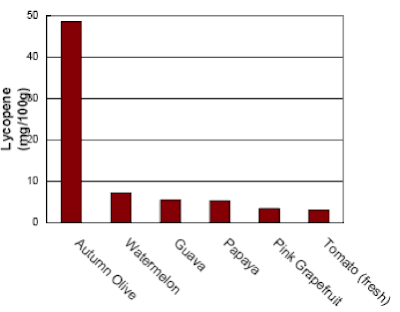 But the best reason is that it is an unexpectedly rich source of lycopene ... nearly 15 times that of raw tomatoes. Not all Autumn Olive bushes are equal. Before you start loading your buckets, roam your picking area and taste them. I find that bushes that get morning sun, but shade from 11:00 AM on yield the sweetest berries. The sweeter the berry, the less sugar you will need. Although sweet is a relative term here ... these berries are a might tart. I look for plump bright red berrries. I use a shopping bag as my bucket and place the fruit laden branch inside the bag and strip them from the branch. For rthis recipe you will need 4 cups of pulp. I had to pick about 7 cups of berries. To make the berry pulp, add one half cup of water to every 4 cups of berries and boil on the stove until the seeds have separated from the berry. (I actually added sprigs of mint to the berries at this stage. It is also where you would add the lemon juice if using.) Run through a food mill or a sieve and return pulp to a saucepan on the stove. Add the honey and Stevia. If you want a sweeter fruit leather, then add sugar one tablespoon at a time to the simmering pulp, tasting for desired sweetness. Lay a piece of parchment paper on a cookie sheet and spread the pulp on the parchment to a 1/8-1/4 inch thickness. Place in a 140 degree oven (mine doesn't stay that low so I did mine at 170 degrees) for 10-12 hours. You can tell if it is ready by peeling it from the parchment and by touching it in the center of the tray. When it is done it will be tacky but not sticky. Also when it has cooled it is more likely to be less sticky than when you test it when it is warm. I decided to cut mine in half lengthwise. I stored one half by rolling it in plastic wrap and putting it in the freezer. The second half I halved again and put a plastic wrapped roll in the fridge and the other half I cut up into little pieces to use in salads where I would normally use dried cranberries. These I stored in a glass jar. I had no idea you could eat this stuff! It's a royal pain in conservation land and other places. Is there a difference between Russian Olive and Autumn Olive? Yes there is a difference, Barry. It probably warrants its own post. I only found out that autumn olive was edible this year. I have two grocery bags of berries in the fridge and was looking online for a jelly recipe when I found your site. Now I need to make a batch of leather too. Thanks for the help! I make 10+ pounds of Autumn Olive Fruit leather every year and never add anything to it (no sugar or other sweetener, no lemon juice, etc.) so it is just 100% wild fruit pulp. I have fed it to hundreds of people and just about everyone really likes it. The key is to start with fruit that has the right combination of sweetness and tartness - I find that only about one of every 2-3 dozen AO bushes I encounter produce fruit that's tasty enough to go into my fruit leather. Fortunately the bushes fruit prolifically enough that you can usually gather all you can use even if you're "picky" about which bushes you pick from. Actually, Russ, YOU were the one who taught me that trick about tasting the bushes first. I attended your edible wild session at Polly Hill last Spring. can you a pie with the olive berries? I've been searching for an olive berry pie recipe, but no luck. Do you have one or know where I could find one? This recipe sounds great! But do you have to store it in the freezer/fridge, or can I keep it all in a glass jar? How long would it stay good? SHerry, the pie recipe is not anything I have tried ... sorry. Inga, I stored mine in the freezer last year once New Year's had passed. But it keeps nicely wrapped in plastic wrap right through the holiday season. Thank you for posting this recipe. I'm off to make it now...my first time wildcrafting autimn olives. I noticed a big difference in the taste from the 3 bushes I picked. One tasted like a granny smith apple just a little tart with a real apple taste, one was sweet and barely tart and the other with an exposure to east, south & west sun was wicked tart. Thanks for the recipe. Every summer/fall I turn more people on to AO, usually by picking them on the side of the road. We made wine with it a couple years ago. Pretty good. Thanks again! What is the difference between Russian olives and Autumn olives? I know there is a recipe for Russian olive candy, but can't find it anywhere. Hi -- I stumbled on this site while searching for what to do with the prolific autumn olives on my property. Can't wait to try the fruit leather! Thanks for sharing it. I like your quote at the top of the page. 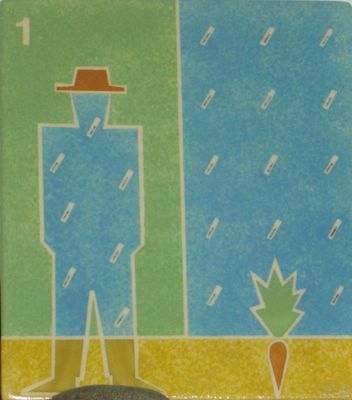 It would be nice if you posted a credit to David Mallett for the lyrics, as they come from his Garden Song. Has anyone else found that eating Russian Olive pulp makes your tongue sore, sometimes the inside of your ips? Am I picking them when they aren't ripe enough? But if I don't pick them when I see the first birds coming to feast on the berries, they'd strip the tree almost in one day. I do mix with a little sugar when I make the pulp and it's delicious over ice cream, or boiled down to a "butter" and spread on toast. But I can't eat more than just a bit before my tongue goes numb. Thoughts? Thanks for this. I think you'll like to hear this: I made the autumn olive leather the other night and it not only came out great, but it inspired others to try. I live in a Shutesbury, MA, and a woman who just moved next door asked to try a piece and was floored! She brought some to the elementary school she works at and is now going to be working with the kids afternoon to make autumn olive fruit leather as a snack, rather than the usual saltines and other non-so-nutritious things! Susan ... I have learned to pick later and later each year. In coastal Massachusetts that is early October now. Maybe that will make a difference for you. Ryan ... thank you for sharing this. I can just picture little armies of grade schoolers taking down the invasive autumn olive once and for all and turning it into nutritious snack food. Thanks for the leather info! Does anyone know about the make up of the fruit? I know it is high in lycopene but have wondered why it separates into bands of white liquid. If you leave it to cool after removing the seeds the white liquid will come to the top. Does anyone skim that? My jam "marbles" with bands of the white stuff throughout. Also do you remove ALL those little stems? thanks!! I run my pulp through a sieve which gets rid of the stems. And I do skim the white stuff. I have no idea why it shows up or what it is. We made 6 trays of fruit leather in an American Harvest dehydrator, and are having a terrible time peeling the leather up from the plastic sheet inserts. It's easier when the leather is warm, but still difficult, and we're getting a lot of torn pieces. This is with pure autumn olive puree that was cooked and put through a mill per the process in Russ Cohen's book. I discovered today in the Nesco American Harvest use guide/recipe book that they recommend spraying the fruit leather trays with a cooking spray before pouring on the puree. Wish I had read this earlier! I don't think I've ever heard of olive berry. I had googled olive recipe and came upon your site. So to see that it is some type of fruit is pretty neat. I will have to keep my eyes peeled or ask around my local garden centers if they carry this. It looks like a pretty tree. Thank you so much for posting! We have two enormous Autumn Olive trees by our house, and I am planning to make this recipe tomorrow... Very interesting, too, how the sweetness of the berry will vary from tree to tree... They're taking over, so we might as well eat them! so cool - thanks for sharing. This is very interesting..... This is really great thanks, It really is such a lovely post! Just would like to ask if you have to take seeds out? If so how do you do that? Can you dry the fruit without making it into leather? I'd love to just have dried berries but I wasn't sure how they'd turn out. Please be sure to know the difference between a Shrub Honeysuckle and an Autumn Olive when picking the berries! The Autumn Olive leaves are silvery gray underneath and the berries have little specks. 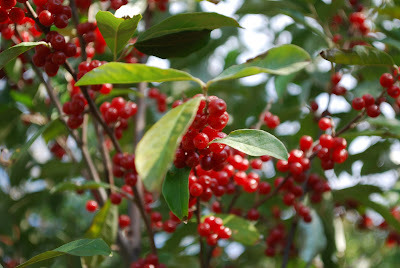 The Shrub Honeysuckle berries look brighter red with lines and are fewer in a cluster. Check for pictures online. the idea of wine has inspired me to try it in my kombucha second ferment. we shall see. Seems I have something to say here every few years, my last post being about a pie recipe in 2013 (actually that was more of a tart). But now I have a new recipe that is a huge favorite among my friends: autumn olive bars! We all know and, presumably, love, lemon bars. This is that recipe adapted to use autumn olive puree instead of lemon. Autumn olive bars is the first one. I just made a batch for a party today and thought I really should share with this group, now that I finally got it right. 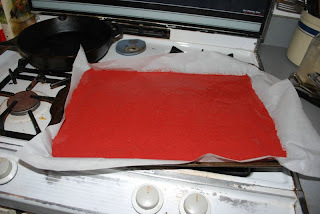 And of course, I also made a batch of fruit leather. Eat from the trees as you gather for jelly's and ciders. Trim them in winter so they flower in spring. I have used the Blackberry Chiffon Pie recipe by Lisa Lavery found at http://www.chowhound.com/recipes/blackberry-chiffon-pie-30424 as the basis for my Autumn Berry Chiffon Pie. Replace the fresh blackberries with Autumn Berries. I also just purchase pie shells at the local grocery store but I am sure the Nilla Wafer pie crust would be great with the Autumn Berry filling.